Standing vote for Tisbury school article. The vote was 319 to 99. The question still needs approval in the ballot box in two weeks when voters will be asked to exclude the debt from the Proposition 2 1/2 state tax cap. But on Wednesday school administrators, teachers, planners and supporters were rejoicing in the moment. “It's very exciting,” Vineyard schools superintendent Matthew D’Andrea said after the vote. He praised the work and dedication of the school building committee. A single item on the 40-article annual town meeting warrant, the school question was debated for three hours over Tuesday and Wednesday. On Wednesday moderator Deborah Medders made it clear she intended to move the meeting along. Discussion was limited to two hours, set to end at 9:30. On both nights, long lines formed at every mic in the gym. Chief concerns among opponents centered on the hit to the tax rate from the largest capital spending project in recent memory. “I don’t see how we can incur a $47 million expense given our current operating expenses . . . I can’t pay this bill,” said Rachel Orr, speaking on Tuesday night. In a long prepared speech, planning board charman Ben Robinson criticized the building committee, claiming it never fully vetted the option of renovating the old brick school that dates to 1929. But on Wednesday night backers of the new school project appeared to turn out in force. More than 300 voters filled the gym. “This is a town project. This is not a school project,” said Colleen McAndrews, chairman of the school building committee. “The world that they're going to be inheriting is really different from the world we grew up in,” he said. The standing vote came just before 9:45 p.m. Voters then turned to other articles before the moderator called a recess just after 11 p.m. The town meeting convene agains Thursday night at 7 p.m., with more than 30 articles left on the warrant. No one misses you, Islander. Last night the town began a process of optimism, based upon reality. I believe we all do not look forward to more taxes, but the town has a chance to move forward with this and other projects. This school will become an island magnet for all young people with children. People like the "Islander" unfortunately live in a negative, sad world, thinking of what cannot be done. You moved because the purest form of democracy, a town meeting, works? God forbid anything ever changes or improves that doesn't directly benefit you. I have no dog in this particular fight but we all go through it. The other side of the "to live in a negative, sad world, thinking of what cannot be done" coin, is " to live in a positive, responsible world, thinking of what we cannot afford "! Wow, Where to start? Thank you to all the non Tisbury voters for bashing the democratic process. A couple of facts for your consideration. Non voting homeowners have a choice. Change your residency or sell your home if you don’t agree with your tax bill. Most of those folks don’t even notice. Tisbury taxes are 30th lowest in the state out of over 350 municipalities. Nobody likes to give away their money , but 320 municipalites pay higher rates thank we do. Pretty sure most of them don’t have harbors and harbormasters and other infrastructure costs associated with being on an island. I get it. For lots of folks this will hurt. I will make choices based upon the increased taxes. 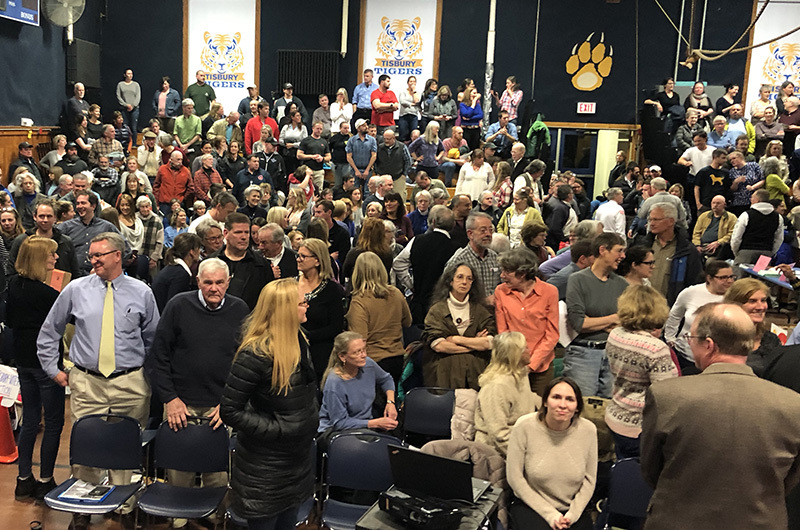 It was sad that so many people stood up at town meeting and had nothing good to say about the nearly 3 year process that so many people invested in. It passed by a 3 to 1 margin and now goes to the ballot box. Celebrate democracy. We don’t all win!